Check out this modern dinosaur birthday party! 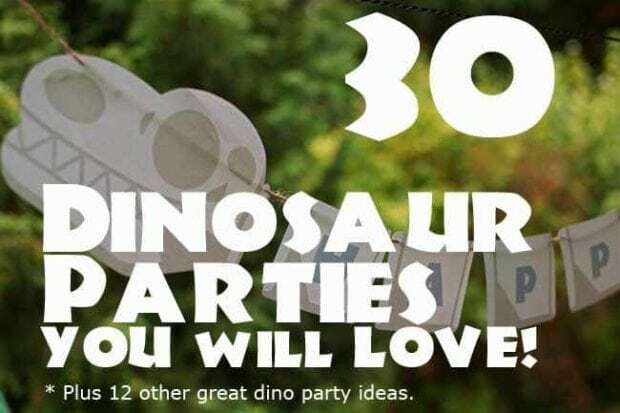 While looking at my 30 Dinosaur Party Ideas You’ll Love post, I decided to do a whole week of dinosaur party ideas! There are so many great ideas out there for this fantastic and popular boy’s theme, and I’m excited to include this dinosaur birthday party from Frog Prince Paperie as one of them! From the dinosaur birthday cake ideas to the party games, this celebration gets our roar of approval. You wont want to miss out on this Boy’s Dinosaur Birthday Party. This Prehistoric Dinosaur Birthday Party is full of great ideas. One of Paula’s customers threw the party for her son. Guests were greeted to the Dino Den with dinosaur footprints and signs up the walkway! I always think it’s great when hosts carry a theme outside to greet their guests. Inside, guests were welcomed to a beautiful green and blue table set up! I really like the thick, green ribbon holding up the happy birthday banner over the table! The back drop is simple, blue fabric and the table is laid with a clean, white linen. All the food is served on simple wooden dishes and clear glass. How fantastic is this birthday cake!? I LOVE that they did little footprints all the way around! The dinosaur’s expression is so happy as well! Perfect for celebrating a birthday boy! All of the food guests enjoyed kept with the blue and green color scheme. There were several green candies, cupcakes, and chocolate dipped pretzel sticks. The cupcakes look cute wrapped in two different wrappers! The custom labels on the water bottles and silverware go great with the theme as well. One of the highlights of the party was the huge, dinosaur bounce house set up for guests to enjoy! What a fun way to burn off that sugar energy!